More flowers! Someone on tumblr suggested doing tutorials. I figured that the florals seem to be generally popular so why not start with that? I have a lot of step-by-step photos to edit and I'm really busy with school so the actual tutorial might not be published for a while. I'm planning for it to be a two-in-one kind of thing: how to do a gradient plus the flower technique. I used Pop Art Pink for the base with Essie Tart Deco sponged for the gradient. I proceeded to layer that with China Glaze Temptation Carnation. 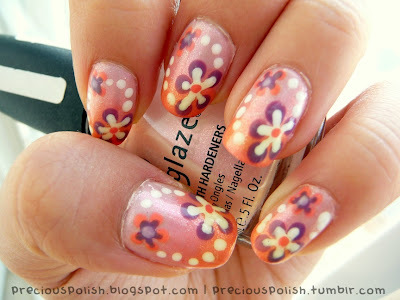 The flowers were done with Essie Tart Deco, Essie Pop Art Pink, American Apparel Dynasty and a white striping polish.